San Diego Zoo sign and logo on Park Blvd. Entrance to the zoo with sculpture "Rex's Roar" after the lion that inspired the zoo. Balboa Park, San Diego, California, U.S. The San Diego Zoo is a zoo in Balboa Park, San Diego, California, housing more than 3,500 animals of more than 650 species and subspecies. Its parent organization, San Diego Zoo Global, is one of the largest[better source needed] zoological membership associations in the world, with more than 250,000 member households and 130,000 child memberships, representing more than a half million people. The San Diego Zoo was a pioneer in the concept of open-air, cageless exhibits that re-create natural animal habitats. It is one of the few zoos in the world that houses, and successfully breeds the giant panda. In 2013, the zoo added a new Australian Outback exhibit, providing an updated Australian animal experience. Another new exhibit, called Africa Rocks, opened in 2017. "Wouldn't it be wonderful to have a zoo in San Diego? I believe I'll build one." Animal collector Frank Buck went to work as director of the San Diego Zoo on June 13, 1923, signed to a three-year contract by Wegeforth. William T. Hornaday, director of the Bronx Zoo, had recommended Buck for the job, but Buck quickly clashed with the strong-willed Wegeforth and left the zoo after three months to return to animal collecting. After several other equally short-lived zoo directors, Wegeforth appointed the zoo's bookkeeper, Belle Benchley, to the position of executive secretary, in effect zoo director; she was given the actual title of zoo director a few years later. She served as zoo director from 1925 until 1953. For most of that time she was the only female zoo director in the world. She was succeeded as director by Dr. Charles Schroeder. The San Diego Zoo was a pioneer in building "cageless" exhibits. Wegeforth was determined to create moated exhibits from the start, and the first lion area at the San Diego Zoo without enclosing wires opened in 1922. The zoo's Center for Reproduction of Endangered Species (CRES) was founded in 1975 at the urging of Kurt Benirschke, who became its first director. CRES was renamed the division of Conservation and Research for Endangered Species in 2005 to better reflect its mission. In 2009 CRES was significantly expanded to become the Institute for Conservation Research. The world's only albino koala in a zoological facility was born September 1, 1997, at the San Diego Zoo and was named Onya-Birri, which means "ghost boy" in an Australian Aboriginal language. The San Diego Zoo has the largest number of koalas outside of Australia. In 2014, a colony of African penguins arrived for the first time in the zoo since 1979. They have since moved into Africa Rocks when it opened in 2017. In 2016, Baba, the last pangolin on display in North America at the time, died at the zoo. The San Diego Zoo has had a number of notable escapees through the years, the most noteworthy of them is Ken Allen, a Bornean orangutan who came to be known as "the hairy Houdini," for his many escapes. In 1940, a Malayan Tapir managed to escape several times which gained it the nickname "Terrible Trudy". 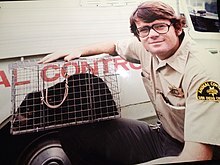 In 1977, an animal control officer for the County of San Diego, Tom Van Wagner, a previous employee of the San Diego Zoo as a tour bus guide, captured a Tasmanian devil escapee in a south central San Diego home’s garage. The animal was transported to the zoo and the zoo hospital staff took possession of the capture. In early 2015, two Wolf guenons monkeyed around outside of their Ituri Forest enclosure. One of the monkeys neared a fence line off of Route 163, but was brought back to safety without injury. In 2014, a koala named Mundu escaped to a neighboring tree just outside its Koalafornia Australia Outback enclosure. Zookeepers lured him down the tree once the park closed that day. In March 2013, the zoo, which was hosting a private party at the time, had to initiate a lockdown when two striped hyenas somehow got past their barriers, before they were "darted with a sedative and taken to the veterinary care clinic." Exhibits are often designed around a particular habitat. The same exhibit features many different animals that can be found side-by-side in the wild, along with native plant life. Exhibits range from an African rain forest (featuring gorillas) to the Arctic taiga and tundra in the summertime (featuring polar bears). Some of the largest free-flight aviaries in existence are here. Many exhibits are "natural" with invisible wires and darkened blinds (to view birds), and pools and open-air moats (for large mammals). The temperate, sunny maritime climate is well suited to many plants and animals. Besides an extensive collection of birds, reptiles, and mammals, it also maintains its grounds as an arboretum, with a rare plant collection. The botanical collection includes more than 700,000 exotic plants. As part of its gardening effort, it raises some rare animal foods. For example, the zoo raises 40 varieties of bamboo for the pandas on long-term loan from China, and it maintains 18 varieties of eucalyptus trees to feed its koalas. Monkey Trails showcases monkeys and other animals from the rainforests of Asia and Africa. Opened in 2005, it replaced an older exhibit known as the Monkey Yard. Monkey Trails is home primarily to monkeys such as guenons, mangabeys, Angola colobuses, tufted capuchins, spider monkeys, and mandrills, but it also showcases many other species of animals, such as yellow-backed duikers, pygmy hippos, slender-snouted crocodiles, and many species of turtles, snakes, lizards, and fish can be seen in a series of water/land exhibits all with underwater viewing areas. In smaller exhibits are many reptiles and amphibians such as pancake tortoises, and many species of arthropods such as Madagascar hissing cockroaches. Monkey Trails utilizes a new method of displaying arboreal animals—by climbing up an elevated walkway throughout the exhibit. Some of the horticultural highlights in Monkey Trails include a ficus tree, cycads, and a bog garden. As of December 2017, the San Diego Zoo is one of four zoos in the U.S. which have giant pandas on display, and is the most successful in terms of panda reproduction. The first two giant panda cubs in U.S. history to have been born in the U.S. and survive into adulthood, Hua Mei (female, born to Bai Yun and Shi Shi) and Mei Sheng (male, born to Bai Yun and Gao Gao), were born at the San Diego Zoo, in 1999 and 2003, respectively. Since then, four more giant panda cubs, Su Lin and Zhen Zhen (both females), Yun Zi (male), Xiao Liwu (male), have been born to the resident giant panda parents Bai Yun and Gao Gao. All these American-born cubs except Xiao Liwu have been sent back to China to participate in the breeding program there. These giant pandas are viewable from a web based exhibit called the San Diego Zoo panda cam. A sixth cub, Xiao Liwu (meaning "little gift"), was born on July 29, 2012, and was first let outside for visitors to see on January 9, 2013. In addition to being able to view this rare animal species, the nearby Giant Panda Discovery Center has interactive exhibits that let the visitor experience first hand what the animals smell and sound like. Since the opening of Panda Trek there are now more native Chinese animals, including Sichuan takins, a red panda, Mangshan pitvipers, and an exhibit comparing several types of bamboo. On the side of the exhibit is an slope featuring Amur leopards and snow leopards. The Urban Jungle houses different animals including a small herd of masai giraffes, Soemmerring's gazelles, red kangaroos, Indian rhinos, flamingos, red river hogs, Bactrian camels, and cheetahs. Many of the Zoo's animal ambassadors live there including a binturong, clouded leopards, crested porcupines, southern ground hornbills, and a tamandua. The giraffes living here are on what was Elephant Mesa. There is also a theater where the zoo has its "Animals in Action" show. The Discovery Outpost is located in the southeastern corner of the zoo. It is where the reptile house is located along with the new reptile walk. Inside is the children's zoo and the Discovery Playground. A small bird aviary called the hummingbird aviary includes sunbirds, manakins, tanagers, euphonias, purple honeycreepers, plate-billed mountain toucans, green aracaris, and hummingbirds. There is also an insect house with an insect collection including live insects: leafcutter ants, stick insects and water beetles. A petting zoo, called the petting paddock which is home to different breeds of sheep & goats, along with rabbits, pigs, chickens & mini horses. Other animals in the Children's Zoo include naked mole rats, fennec foxes, ocelots, mice, macaws, southern tamanduas, & porcupines. Reptiles at the reptile house & reptile walk include Chinese alligators, Galapagos tortoises, Komodo dragons, anacondas, cobras, monitor lizards, pythons, bushmasters, caiman lizards, Fiji banded iguanas, water cobras, short-nosed vine snakes, black-headed pythons, Boelen's pythons, coachwhips, side-striped palm-pit vipers, Ethiopian mountain adders, flower snakes, radiated tortoises, European pond turtles, ocellated lizards, European glass lizards, leopard tortoises, African spurred tortoises, savannah monitors, Vietnamese mossy frogs, freshwater crocodiles, along with various snakes, lizards, iguanas, turtles, frogs, toads, salamanders, newts, & caecilians. Based upon the real Ituri Forest in Africa, this exhibit opened in 1999, and houses different animal species from the rainforests of central Africa. The exhibit begins with a forested exhibit for okapi & black duiker then winds past a recreation of two leaf-covered Mbuti huts with signage about the people's customs and traditions. Next, the path leads to the hippopotamus exhibit, which also houses tilapia, and has an underwater viewing area. After the hippos, the path passes through a bunch of bamboo before reaching a clearing where aviaries have housed great blue turaco, emerald starlings, tambourine doves, crowned eagles, and Congo peafowl. A thatched-roof gift shop and a food stand are located in a plaza near by. Immediately to the right is the African forest buffalo exhibit, which also houses De Brazza's monkey, Allen's swamp monkey, Schmidt's spot-nosed guenon, and spotted-necked otters. The plaza leads to a bridge flanked by the buffalo exhibit on one side and an exhibit that only the small monkeys and otters can access on the other. Across the bridge is a creek where the otters can swim, with viewing both above and below the water's surface. Afterwards, the path joins the rest of the zoo. This exhibit opened on May 23, 2009, on the site of the former Hoof and Horn Mesa area. The main feature of the exhibit is the 2.5-acre (10,000 m2) African and Asian elephant habitat — more than three times the size of the zoo's former elephant exhibit, in what used to be Elephant Mesa (now the heavily panned "Urban Jungle" exhibit area). Formerly a herd of 10, The herd now includes four females. (Tembo, Devi, Mary and Shaba) and consists of a blended herd of two African and Asian elephants. Elephant Odyssey also features a glimpse of the past with the Fossil Portal and life-size statues of ancient creatures of Southern California next to the exhibits of their modern-day counterparts. The ancient life represented include the Columbian mammoth, the saber-tooth cat, the American lion, the Daggett's eagle, and the Jefferson's ground sloth. Elephant Odyssey's other animal exhibits include African lions, jaguars, Baird's tapirs, guanacos, capybaras, spur-winged geese, two-toed sloths, Kirk's dik-diks, secretary birds, dung beetles, water beetles, desert tarantulas, toads, newts, turtles, frogs, dromedary camels, pronghorns, Przewalski's wild horses, burros, llamas, rattlesnakes, western pond turtles, and the California condor. The beginning of Elephant Odyssey is the Fossil Portal, an artificial tar pit that periodically drains to reveal man-made Pleistocene-era bones. The path turns a corner and opens up at the Mammoth Passage Plaza, with exhibits for jaguars and African lions to the left, an exhibit that has housed two-toed sloths to the right, and the tip of the elephant exhibit, with a large wading pool, straight ahead. The path continues to the left along the pool, passing by the jaguar exhibit on the left. The northern end of the elephant pool drains into the Mixed Species Exhibit, which houses tapirs, capybaras, guanacos, & a goose. The path meets up with the elephant exhibit again before it reaches the Elephant Care Center, where visitors can watch keepers care for the animals. Next is an exhibit for secretarybirds with grasses, a tree and a statue of the extinct Daggett's eagle nearby. Afterwards, the path goes down a crevasse with a wall embedded with vivaria for dung beetles and diving beetles, among other aquatic insects. The path tunnels below the elephant exhibit to reach the other side, where it continues between the elephant exhibit and a creek for native reptiles and amphibians. Just past the source of the stream is a restaurant and gift shop, and after that is a couple of exhibits for pronghorns, horses, and camels. Next the path splits between a playground, a rattlesnake terrarium, and a California condor aviary with artificial rock spires and a stream. The paths then reunite and join the rest of the zoo. Simulating the rainforests of central Africa, and opened in 1991, Gorilla Tropics has an 8,000-square-foot (740 m2) enclosure for the eponymous species. The exhibit has waterfalls, a meadow, and tropical plants such as allspice, coral trees, and African tulip trees, as well as several species of bamboo. Guests can view the seven western gorillas from a viewing window, across a waterfall, and across a creek. This exhibit opened in 2003, as a major renovation of the former "Whittier Southeast Asian Exhibits", which had opened in 1982. It houses four Sumatran orangutans (a Bornean orangutan was also kept here) and siamangs in an 8,400-square-foot (780 m2) exhibit, which is flanked by a 110-foot (34 m) glass viewing window. The exhibit provides sway poles and artificial trees for the primates to swing on and a fake termite mound for them to fish condiments out of. The viewing area is designed to resemble the mulch-lined exhibit side of the viewing window by having rubber mulch, and miniature sway poles for kids. Some plant species in the exhibit are toog trees, carrotwood trees, and markhamia trees. The zoo has bred and maintained bonobos (pygmy chimps) since 1960. In 2018, The San Diego Zoo has nine bonobos. A tiger exploring a San Diego Zoo exhibit. 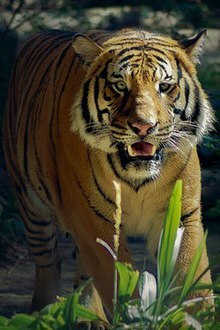 Tiger Trail, located in a sloping canyon, opened in 1988 and houses Malayan tigers. From the top of the canyon, the path first goes through a pavilion with underwater viewing of crocodilians such as gharials and other aquatic reptiles. It proceeds to another pavilion, this time flanked by the Marsh Aviary, with white-collared kingfishers and storks and a fishing cat exhibit. Farther down the canyon is an exhibit for Malayan tapirs, babirusa & Visayan warty pigs and the 1⁄4-acre (0.10 ha) tiger habitat, which has a hillside stream, waterfall, and glass viewing window. A new Australian Outback area, nicknamed "Koalafornia", opened in May 2013. It has twice as much exhibit space for koalas, including more outdoor enclosures based on a realization that koalas need sun exposure for their health. The new area includes other Australian marsupials such as wombats, Goodfellow's tree-kangaroos, ringtail possums and wallabies,& Australian birds such as kookaburras, blue-faced honeyeaters, masked lapwings, & palm cockatoos. Even the short-beaked echidnas are housed there, even though they are monotremes. Since October 2013 the exhibit also houses Tasmanian devils, the first American zoo to do so; the animals are now kept in half a dozen zoos in the Americas as part of the Australian government's Save the Tasmanian Devil Program. The zoo finished building a new cougar exhibit in 2014. Conrad Prebys Africa Rocks highlights the biodiversity of Africa. The exhibit opened in Summer of 2017. The exhibit cost US$60 million to construct. The money was donated to the zoo by 3,800 donors. Africa Rocks replaced Dog and Cat Canyon, which featured exhibits that were built in the 1930s. The Cape Fynbos exhibit features African penguins, an endangered species native to South Africa.The exhibit was designed to mimic the giant granite boulders that are found on Boulders Beach in South Africa, a place where these birds live. The 70-foot-long and 10-foot-wide habitat also includes a 200,000-gallon pool for the penguins that stretches 170 feet, with depths up to 13 feet. Along with the large pool, the exhibit features a cobblestone beach and a nesting area. A group of 20 penguins moved in on June 22, 2017 to get ready for when the exhibit opened on July 1, 2017. The penguins also share their exhibit with leopard sharks. Twelve leopard sharks arrived at the San Diego Zoo on June 23, 2017 from SeaWorld San Diego. The sharks were introduced to their exhibit and their penguin neighbors on Wednesday, June 28, 2017. The sharks range in age from 5 to 20. Leopard sharks do not live alongside African penguins in the wild, however, they do live with similar shark species. Leopard sharks feed on crustaceans on the bottom floor and do not serve as a threat to the penguins. The Acacia Woodland exhibit features a leopard exhibit, a troop of vervet monkeys, and an aviary. The leopard does not feature the African subspecies of leopard, however. Amur leopards, from as far as Russia to Northern China, are exhibited instead. This is because the Amur leopard is critically endangered, for there are around 60 individuals left in the wild. The San Diego Zoo participates in the Amur leopard Species Survival Plan, a breeding program that focuses on preserving the genetics of this endangered cat. The Acacia Woodland exhibit will allow the Zoo to have more breeding spaces for the cats. The Zoo has a spotted and black Leopard, as well as two new cubs. Along with the leopard exhibit, the Acacia Woodland exhibit in Africa Rocks features a vervet monkey troop. The vervet monkeys are very agile and one of the only primate species that lives in a woodland habitat. The aviary in this exhibit features two species of bee eaters, the white-fronted and white-throated, as well as black-headed weavers and several other bird species. The exhibit also features African Silverbills, African Pygmy Geese, African Jacanas, Amethyst starlings, Beautiful Sunbirds, Blue-naped mousebirds, Collared Pratincoles, Common Waxbills, Emerald-spotted wood doves, Fischer's Lovebirds, Golden Breasted Starlings, Greater Painted Snipes, Long-tailed paradise whydahs, Magpie Mannikins, Melba Finches, Namaqua Doves, Pin-tailed whydahs, Purple Grenadiers, Red-billed firefinches, Red-cheeked cordon-bleus, Snowy-crowned robin-chats, Stone Partridges, Village Indigobirds, White-bellied go-away-birds, White-headed buffalo weavers, Yellow-crowned bishops, Yellow Necked Francolins, Yellow-mantled widowbirds, and Zebra Waxbills. There are also three species of lizards in the aviary Girdled Tailed Lizards, Mali Spiny Tailed Lizards, and Red Headed Rock Agamas. The Madagascar Forest exhibit features lemur species that the Association of Zoos and Aquariums' (AZA) Prosimian Taxon Advisory Group (TAG) has identified as needing sustainability assistance for the North American population. By building this new exhibit, the Zoo will be able to participate in breeding programs that will help ensure healthy populations of lemurs in zoos. The exhibit houses a ring-tailed lemur family consisting of mom Tweena, dad Mathew, and their baby Bijou along with five other Ring Tailed Lemurs. The red ruffed lemurs, one of the most endangered primates in the world, include mom Mortica and her baby Ony (Malagasy for "river"). The Zoo is hoping their Collared brown lemur pair Pierre and Zaza will produce offspring. Aykroyd and Belushi, two male Blue-eyed black lemurs, are still awaiting mates. Ared collard, lemurgrippina, and Thrax are Coquerel's sifakas, the final lemur species exhibited in Africa Rocks. Some of the lemur species will be exhibit together even if they do not live with each other in the wild. Along with lemurs, the Madagascar Forest exhibit houses the lemurs' main predator the fossa as well as the ratel. The Ethiopian Highlands exhibit houses two primate species: the gelada and the Hamadryas baboon. The San Diego Zoo is only the second zoo in North America to house geladas, the other facility being the Bronx Zoo. Alpha male Juma leads the all-male members including Mahbub, Saburi, Abasi, Diwani, and Valentino. the group arrived at the Zoo on September 7, 2016 from the Wilhelma Zoo in Stuttgart, Germany where they lived with 44 other geladas. This move was based by the European Association of Zoos and Aquariums' (EAZA) European Endangered Species Programme (EEP) for geladas—the European equivalent of an Association of Zoos and Aquariums’ (AZA) Species Survival Plan (SSP) program. The bachelor group, who also live with a herd of Nubian ibex, will be introduced to females later on. The Ethiopian Highlands exhibit is also home to a troop of Hamadryas baboons. The word kopje in Dutch means "small head" which perfectly describes the rock formations that seem to pop out in the savanna. Kopjes are homes for well adapted animals. The San Diego Zoo's Kopje Woodland in Africa Rocks is home to animals including klipspringers, rock hyrax, and the dwarf mongoose. Each animal has well adapted feet that allow them to cling to the rocks. The exhibit also includes these animals' main predator the bateleur as well as meerkats, servals and the red-leaved rock fig, a tree species that manages to grow wherever its seeds disperse including the rocky kopje. 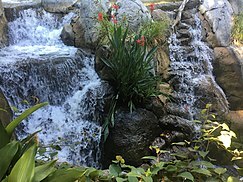 The West African Forest exhibit features Rady Falls, a 65-foot tall waterfall, the largest man-made waterfall in San Diego. At the base of Rady Falls, West African dwarf crocodiles reside in a pond. Reaching five feet in length, this is one of the smallest crocodile species. The West African Forest exhibit also features Madagascan big-headed turtles, West African mud turtles and the floating fig tree. The zoo is active in conservation and species-preservation efforts. Its Institute for Conservation Research (formerly the Center for Reproduction of Endangered Species) raises California condors, giant pandas, tigers, black rhinos, polar bears, orangutans, peninsular pronghorn, desert tortoises, African penguins, mountain yellow-legged frogs, Pacific pocket mice, Francois' langurs, giraffes, quino checkerspot butterflies, Hawaiian crows, light-footed clapper rails, Gray's monitors, tree lobsters, clouded leopards, Galapagos tortoises, Tahiti lorikeets, lion-tailed macaques, mhorr gazelles, gorillas, Przewalski's horses, koalas, burrowing owls, elephants, Tasmanian devils, okapi, Southwestern pond turtles, and 145 other endangered species. As a result, they have reintroduced more than 30 endangered species back into the wild, and have conserved habitat at 50 field sites. They also have over 200 conservation scientists working in 35 countries around the world. It employs numerous professional geneticists, cytologists, and veterinarians and maintains a cryopreservation facility for rare sperm and eggs called the frozen zoo. The San Diego Zoo Institute for Conservation Research is the largest zoo-based multidisciplinary research effort in the world. Based at the Arnold and Mabel Beckman Center for Conservation Research adjacent to the San Diego Zoo Safari Park, more than 200 dedicated scientists carry out research vital to the conservation of animals, plants, and habitats, locally and internationally. The program utilizes a series of "Kits", which are set on tables throughout the zoo. The kits contain objects that can be used to explain why an animal is endangered or to shed light on the animal's lifestyle. Some of the kits are: Conservation Kit, Endangered Species Kit, Behavioral Enrichment Kit, and Animal Diet Kit. Local architect Louis John Gill designed the original buildings, cages and animal grottos and later in 1926, the Spanish Revival-style research hospital, for which Gill received an Honor Award from the San Diego Chapter of the American Institute of Architects. Gill also designed a bird cage at the zoo in 1937, then the largest bird cage in the world. The San Diego Zoo has received numerous awards for its exhibits, programs, and reproduction and conservation efforts. This list includes only awards given to the Zoo specifically, not to its parent organization; for those, see San Diego Zoo Global#Awards. Animals from the San Diego Zoo were often presented to the audience by Shari Lewis throughout Lamb Chop's Play-Along. The shots of the private zoo at Xanadu in Orson Welles' 1941 film Citizen Kane were filmed at the San Diego Zoo. The San Diego Zoo, along with the St. Louis Zoo, were frequently mentioned in the Yogi Bear series of media as possible destinations Ranger Smith may ship Yogi to if he caused too much trouble at Jellystone Park. In the 1964 film Hey There, It's Yogi Bear!, Yogi was actually shipped to the San Diego Zoo, and his escape from being shipped off forms the plot of the film. The front cover of The Beach Boys' 1966 album Pet Sounds was photographed at the San Diego Zoo. The zoo is mentioned though not actually shown, in the film The Lost World: Jurassic Park. The 6ths' first album Wasps' Nests includes a song called "San Diego Zoo", which features comprehensive directions on how to get to the zoo. The first YouTube video, Me at the zoo, was shot in San Diego Zoo and was uploaded to YouTube on April 23, 2005, by the website's co-founder, Jawed Karim. It can still be viewed on YouTube. 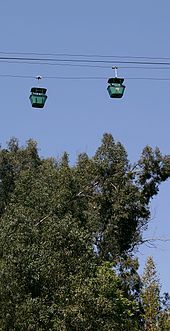 The San Diego Zoo is mentioned in the 2005 DreamWorks Animation film Madagascar from Melman because of wide open spaces when the gang landed in the island of Madagascar. In the 2008 DreamWorks Animation film Madagascar 2: Escape to Africa the animals saw their home in Africa that resembles the African Savanna exhibit from San Diego Zoo Safari Park. 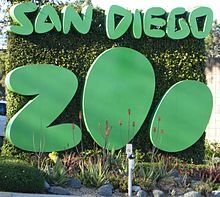 The San Diego Zoo is mentioned in the song "I Go to the Zoo" from the CW show Crazy Ex-Girlfriend. It is referred to as "the zoo in San Diego." ^ a b Lori Weisberg (March 25, 2018). 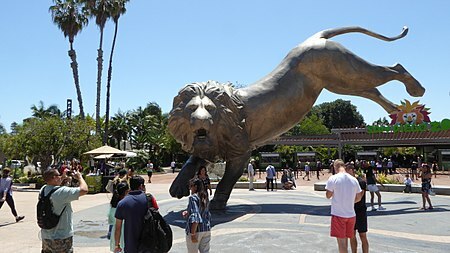 "Rex the lion returns to San Diego Zoo — in bronze". The San Diego Union-Tribune. Retrieved June 4, 2018. ^ a b c d "About the San Diego Zoo". sandiegozoo.org. San Diego Zoo. Archived from the original on December 6, 2010. Retrieved June 6, 2012. ^ "Currently Accredited Zoos and Aquariums". aza.org. AZA. Retrieved July 3, 2011. ^ "American Association of Museums". aam-us.org. AAM. Retrieved July 3, 2011. ^ "Member Location Map". zooaquarium.org.au. ZAA. Retrieved July 3, 2011. ^ "Zoos and Aquariums of the World". waza.org. WAZA. Retrieved July 3, 2011. ^ "About the San Diego Zoo". Sandiegozoo.org. Archived from the original on December 6, 2010. Retrieved December 17, 2015. ^ "10 great places to go wild over zoo animals". USA Today. July 17, 2008. Retrieved February 13, 2016. ^ Klem, Carl. "San Diego Zoo, giant panda research station, Monkey Trails, Su Lin". www.californiaweekend.com. ^ a b Shaw, Marjorie Betts (Summer 1978). "The San Diego Zoological Garden: A Foundation to Build on". The Journal of San Diego History. 24 (3). ^ a b Engstrand, Iris (2005). San Diego: California's Cornerstone. Sunbelt Publications. p. 138. ISBN 978-0-932653-72-7. ^ "Animal Attractions: Amazing Tales from the San Diego Zoo:Modern Zoos". Nature. PBS. Retrieved June 20, 2010. ^ "San Diego Zoo Global". www.sandiegozoo.org. ^ "Counterpunch, December 16, 2008". ^ "An albino koala adds color to San Diego Zoo" CNN.com. June 5, 1998. ^ "Only pangolin on display in the U.S. dies at San Diego Zoo". The San Diego Union-Tribune. September 30, 2016. Retrieved October 10, 2016. ^ "Top 11 Zoo Escapes". Time.com. Retrieved June 24, 2013. ^ "Terrible Trudy". Retrieved April 20, 2019. ^ "Two monkeys briefly escaped habitat". 10news.com. Retrieved January 23, 2015. ^ "Koala escapes enclosure at San Diego Zoo". NBC. Retrieved February 25, 2014. ^ "San Diego Zoo Placed on Lockdown AFter Hyenas Escape Enclosure". NBC. Retrieved March 9, 2013. ^ "About the San Diego Zoo,". sandiegozoo.org. Archived from the original on December 6, 2010. Retrieved January 21, 2016. ^ RITTER, BILL (May 30, 1986). "S.D. Zoo, Workers Stalled in Talks on New Contract" – via LA Times. ^ a b c "San Diego Zoo Exhibit: Monkey Trails". Web.archive.org. October 16, 2006. Archived from the original on October 16, 2006. Retrieved December 17, 2015. ^ "Find Animals & Zoo Gardens". San Diego Zoo. Retrieved December 17, 2015. ^ "It's a boy! San Diego zoo's newest panda cub". CBS News. September 7, 2012. ^ Molnar, Phillip. "Last pandas at San Diego Zoo are leaving for China". latimes.com. Retrieved March 26, 2019. ^ Williams, Ian (January 13, 2014). 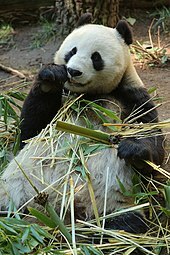 "Eats shoots and leaves: US-born panda Yun Zi starts new life in China - World News". Worldnews.nbcnews.com. Archived from the original on December 22, 2015. Retrieved December 17, 2015. ^ "Panda Cam". August 6, 2013. ^ "Giant Panda Cub Makes Debut at San Diego Zoo". ABC News. Retrieved January 10, 2013. ^ a b c "San Diego Zoo.org". Web.archive.org. Archived from the original on October 16, 2006. Retrieved December 17, 2015. ^ a b c d "Ituri Forest". sandiegozoo.org. Zoological Society of San Diego. Archived from the original on October 16, 2006. ^ "Ituri Forest - Virtual Tour - The Canopy". sandiegozoo.org. Zoological Society of San Diego. Archived from the original on March 1, 2000. ^ "Ituri Fores - Virtual Tour - Mbuti People". sandiegozoo.org. Zoological Society of San Diego. Archived from the original on February 29, 2000. ^ "Ituri Forest - Virtual Tour - River's Edge". sandiegozoo.org. Zoological Society of San Diego. Archived from the original on March 1, 2000. ^ "Ituri Forest - Virtual Tour - Bamboo Corridor". sandiegozoo.org. Zoological Society of San Diego. Archived from the original on March 1, 2000. ^ "Ituri Forest Fact Sheet". sandiegozoo.org. Zoological Society of San Diego. Archived from the original on March 12, 2000. ^ "Ituri Forest - Virtual Tour - Trading Post". sandiegozoo.org. Zoological Society of San Diego. Archived from the original on March 1, 2000. ^ "Ituri Forest - Virtual Tour - The Riverbank". sandiegozoo.org. Zoological Society of San Diego. Archived from the original on March 8, 2000. ^ "Lost Forest - Otters and Monkeys". sandiegozoo.org. Zoological Society of San Diego. Archived from the original on October 15, 2009. ^ "Ituri Forest Exhibit Map". sandiegozoo.org. Zoological Society of San Diego. Archived from the original on March 12, 2000. ^ "Ituri Forest - Virtual Tour - River's End". sandiegozoo.org. Zoological Society of San Diego. Archived from the original on March 9, 2000. ^ "Ituri Forest - Virtual Tour - End of the Tour". sandiegozoo.org. Zoological Society of San Diego. Archived from the original on March 9, 2000. ^ "Elephant Odyssey Explore the Exhibit". www.elephantodyssey.com. San Diego Zoo Global. Archived from the original on February 15, 2015. Retrieved February 15, 2015. ^ "San Diego Zoo Exhibit: Gorilla Tropics". Web.archive.org. Archived from the original on October 16, 2006. Retrieved December 17, 2015. ^ "San Diego attractions - San Diego zoo balboa park wild animal park visitor info San Diego California best attractions cheap tickets beaches zoo seaworld balboa park wild animal park la jolla legoland california whales watching old town coronado sandiego california la jolla seaport village cabrillo monument tijuana mexico maps books photos postcards weather info Hotels Resorts Motels Vacation Rentals San Diego City County California Vacation rentals Hostels Camps RV Parks Special Discounts coupons online reservations, downtown, gaslamp quarter, La Jolla, ocean view, beach, pacific, coronado, old town". Entersandiego.com. Retrieved December 17, 2015. ^ "Plants: Gardens". Sandiegozoo.org. Retrieved December 17, 2015. ^ "In San Diego". The New York Times. the New York Times Company. October 17, 2004. Archived from the original on October 28, 2011. ^ "The San Diego Zoo's Absolutely Apes? Absolutely!". about.com. The New York Times Company. Archived from the original on October 28, 2011. ^ a b "Lost Forest Orangutan and Siamang". sandiegozoo.org. Zoological Society of San Diego. Archived from the original on December 6, 2010. ^ "Absolutely Apes". sandiegozoo.org. Zoological Society of San Diego. Archived from the original on October 16, 2006. ^ "Bonobo - Pan paniscus". San Diego Zoo. Archived from the original on February 14, 2018. Retrieved February 14, 2018. Today, there are nine bonobos in the troop, residing in a spacious home in the Zoo’s Lost Forest below the gorillas’ lush habitat. ^ a b Greenwald, Igor (June 28, 1989). "Sun Bear Forest: A Natural Evolution". The Los Angeles Times. Archived from the original on October 28, 2011. ^ a b "Sun Bear Forest". sandiegozoo.org. Zoological Society of San Diego. Archived from the original on October 10, 2006. ^ a b "Tiger River". sandiegozoo.org. Zoological Society of San Diego. Archived from the original on October 16, 2006. ^ Peterson, Karla (May 25, 2013). "Koalas bring the cute to new zoo site". San Diego Union-Tribune. ^ O'Sullivan, Mike (June 26, 2014). "San Diego Zoo Helps Endangered Tasmanian Devils". Voice of America. Retrieved May 16, 2016. ^ Mester, Alexandra (September 6, 2015). "Toledo Zoo joins effort to save Tasmanian devils". Toledo Blade. Retrieved May 16, 2016. ^ "Baby leopards come to San Diego zoo". Fox News. December 10, 2012. Retrieved December 12, 2012. ^ Relations, Public (September 18, 2014). "Rady Challenge Match Met in Record Time at San Diego Zoo". Blogs.sandiegozoo.org. Retrieved February 20, 2018. Rady Falls and the Madagascar habitat are part of the $60 million Conrad Prebys Africa Rocks exhibit complex that will open in 2017. Thus far, the Zoo has raised $45 million, which includes the $30 million from the Rady Challenge. ^ Relations, Public (June 29, 2017). "Diving into a New Realm: San Diego Zoo Welcomes Its First Sharks". ^ Parham, Donna (May 8, 2017). "Woodland Wonders". ^ Parham, Donna (February 20, 2017). "For the Love of Lemurs". ^ Parham, Donna (June 26, 2017). "A Most Unusual Primate". ^ Scott, Peggy (May 29, 2017). "Rock Stars of the Serengeti". ^ Ellis, Eston (July 11, 2017). "A Forest to "Fall" For". ^ "SDZ Global Wildlife Conservancy - Who We Are - Campuses". Sandiegozooglobal.org. Retrieved December 17, 2015. ^ "Zoo Corps: Kids Teaching Kids". San Diego Zoo. Retrieved September 10, 2011. ^ "The Journal of San Diego History "LOUIS JOHN GILL: Famous but Forgotten Architect", Rev. C. Douglas Kroll, SAN DIEGO HISTORICAL SOCIETY QUARTERLY, Summer 1984, Volume 30, Number 3". ^ a b c d e f g h i j k l m n o p q r s t u "SDZG History Timeline". San Diego Zoo Global. Retrieved May 27, 2015. ^ a b c d e f g h i j "Edward H. Bean Award". aza.org. Association of Zoos and Aquariums. Archived from the original on June 22, 2015. Retrieved June 1, 2015. ^ a b c "Exhibit Award". aza.org. Association of Zoos and Aquariums. Retrieved June 19, 2015. ^ "Education Award". aza.org. Association of Zoos and Aquariums. Retrieved June 19, 2015. ^ a b "International Conservation Award". aza.org. Association of Zoos and Aquariums. Retrieved June 21, 2015. ^ "Past Plume Awards Recipients". aviansag.org. Avian Scientific Advisory Group. Retrieved June 21, 2015. ^ "Excellence in Marketing Award". aza.org. Association of Zoos and Aquariums. Archived from the original on June 22, 2015. Retrieved June 19, 2015. ^ "Balboa Park makes list of "coolest city parks"". San Diego Union-Tribune. April 11, 2011. Retrieved July 9, 2011. ^ Catherine E. Bell (2001). Encyclopedia of the World's Zoos, Volume 3. Routledge. p. 1141. ISBN 1-57958-174-9. Retrieved July 8, 2011. ^ "Joan Embry". imdb.com. Interned Movie Database. Retrieved July 8, 2011. ^ "Filming Locations of Anchorman: The Legend of Ron Burgundy". seeing-stars.com. Seeing Stars. Retrieved July 8, 2011. ^ "The Beach Boys Pet Sounds Liner Notes". beachboysfanclub.com. Capitol Records, Inc. Retrieved July 8, 2011. ^ "The Lost World: Jurassic Park film locations". movielocations.com. The Worldwide Guide To Movie Locations. Retrieved July 8, 2011. ^ "Wasps' Nests". houseoftomorrow.com. The Magnetic Fields. Archived from the original on July 18, 2011. Retrieved July 8, 2011. ^ Alleyne, Richard (July 31, 2008). "YouTube: Overnight success has sparked a backlash". Daily Telegraph. London. Retrieved July 8, 2011. ^ "Me at the zoo". YouTube. April 23, 2005. Retrieved July 8, 2011. Amero, Richard W. (2013). Balboa Park and the 1915 Exposition (1st ed.). Charleston, South Carolina: The History Press. ISBN 1-626193-45-2. Wikimedia Commons has media related to San Diego Zoo.